VMware has done a great job with this new VCSA 6.5 appliance. 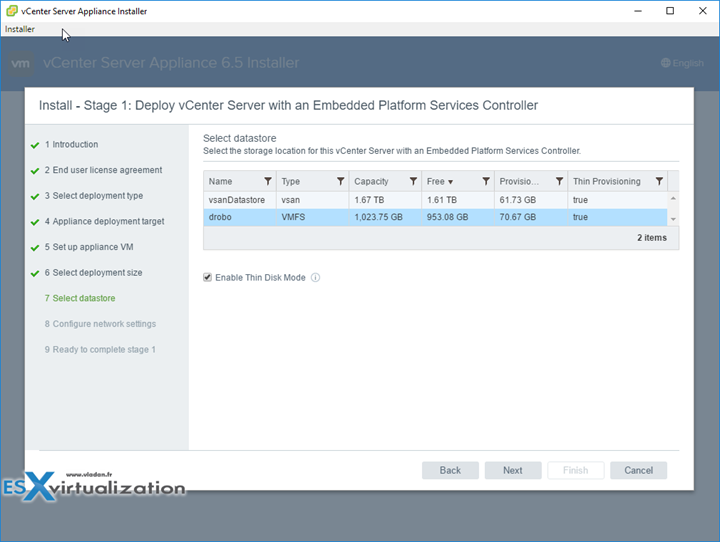 You have already seen my lab deployment of VCSA 6.5 by using VMware Workstation – just to test the workflow, but today we’ll do another lab post. 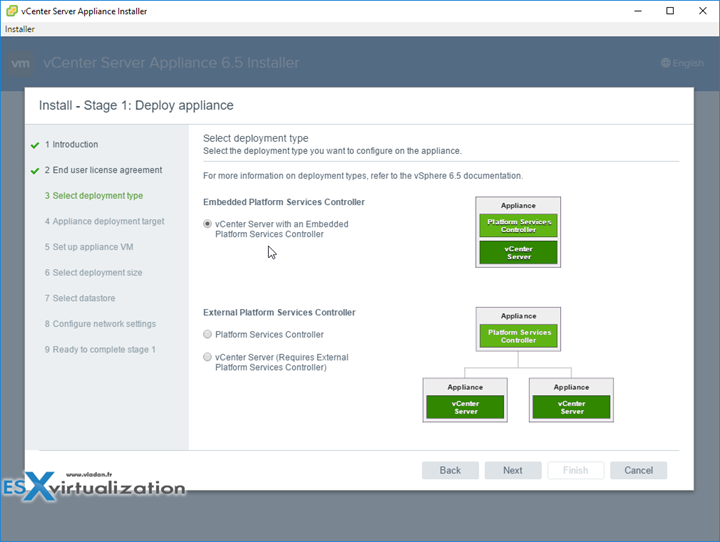 You’ll watch and learn How to deploy VMware VCSA 6.5 (VMware vCenter Server Appliance). I have also done a lab migration from Windows based vCenter 6.0 to the new VCSA 6.5. The migration to VCSA 6.5 went smooth without issues. I know that the process of clean installation of VCSA 6.5 has been documented elsewhere, but for the exercise in my lab, and for the test, I wanted to do it as well. One thing to make sure, before you start, is to create forward and reverse DNS records for the VCSA 6.5. Then, if you do a clean installation, there should not be any issues. 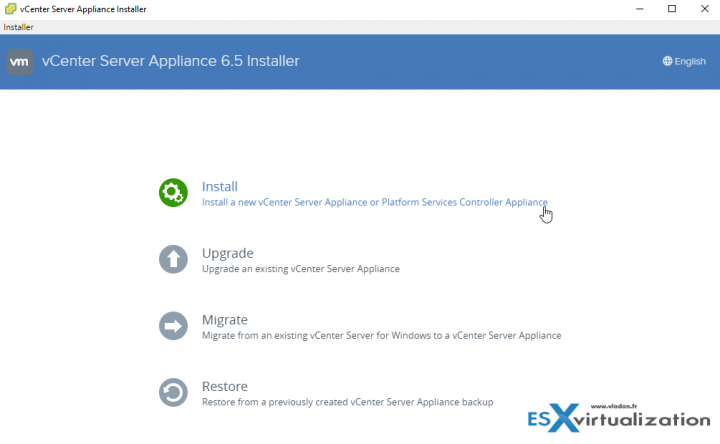 You might be thinking that you want to upgrade your Windows vCenter Server 6.0 to 6.5 (In-place migration) and then migrate to VCSA 6.5, however, this isn’t supported scenario. I’ve heard that a tool allowing this is in preparation, but for now, think twice what you want to do. Let’s get back to our post where we’ll be doing a clean deployment of VCSA 6.5. Step 1: Create DNS records (forward and reverse). 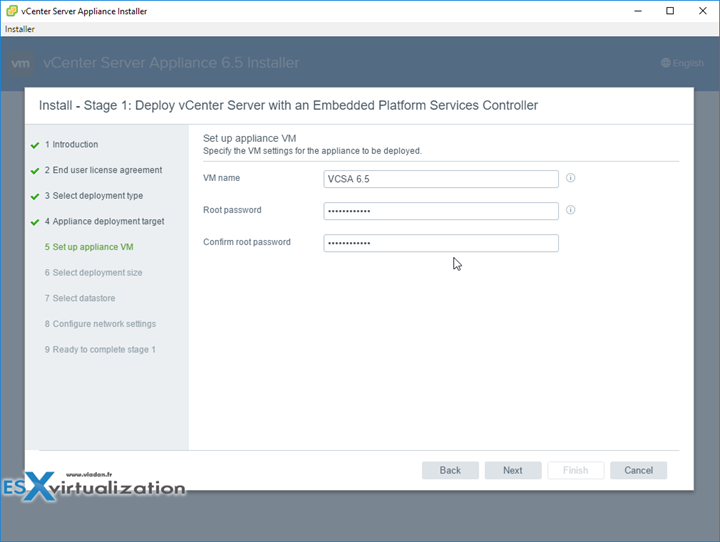 Step 2: Download VMware VCSA 6.5 ISO image from VMware. It is a quite large file. VMware-VCSA-all-6.5.0-4602587.iso is over 3.5 Gb in size. Screenshot showing the ISO mounted as CD-ROM and the folder structure within a Windows environment. From there launch the installer program. And accept the license agreement…. Click next to enter the details of the ESXi host (or vCenter Server) where you will be deploying the VCSA. In our case we’re using standalone ESXi host. You’ll get a certificate prompt which you can safely accept, and then you can enter the name for the VM you’re deploying as well as the root password. then chose the deployment size and storage size. As you can see, the appliance supports up to 2000 hosts !!! The first part, we just did the step-by-step. The second part can be done from within the same window or you can open a browser window to finish the configuration via web browser. Check All vSphere 6.5 articles on our Dedicated vSphere 6.5 WordPress Page !!! Great post, I have really enjoyed your article. 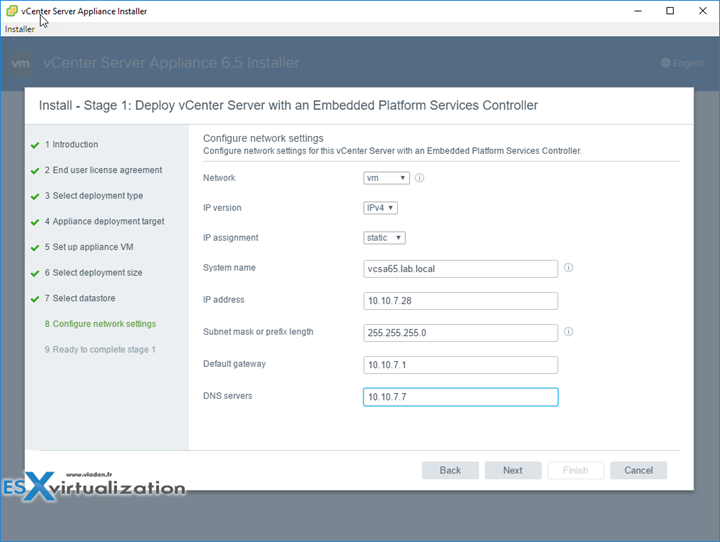 You show how to deploy VMware VCSA 6.5. It is really helpful and it is very simple .I have done by the help of your article . Thanks for sharing .The way you explained each and every step in this article is really great. Thanks once again. Hi; I get up to 80% installing RPM then it just hangs there . ANy idea what I am doing wrong please.? I have setup a pc for DNS server which is on 192.168.0.50 . The ESXI6.5 is on 192.168.0.60.
i think your problem was , that you not definie the correct VM Network. I am having the same issue, are you deploying new or upgrading? “80% installing RPM” hang relates to license problem. If you are using free ESXi you have to remove free license (previously applied) from it and run VCSA setup again. 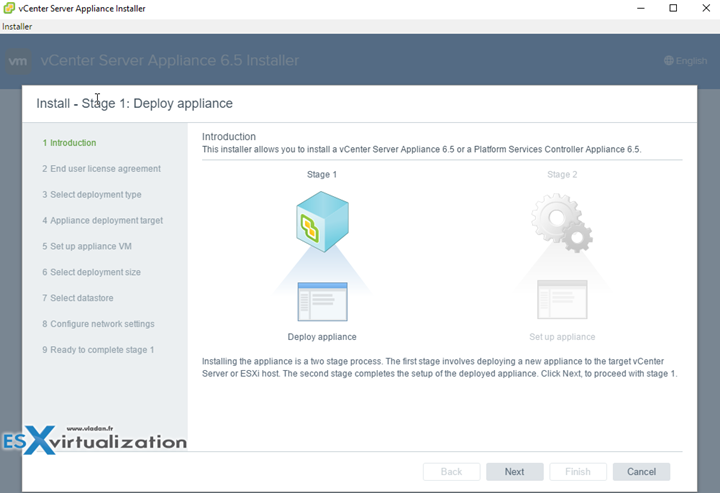 You are probably installing the vCenter appliance to a host that has a free ESXi license. 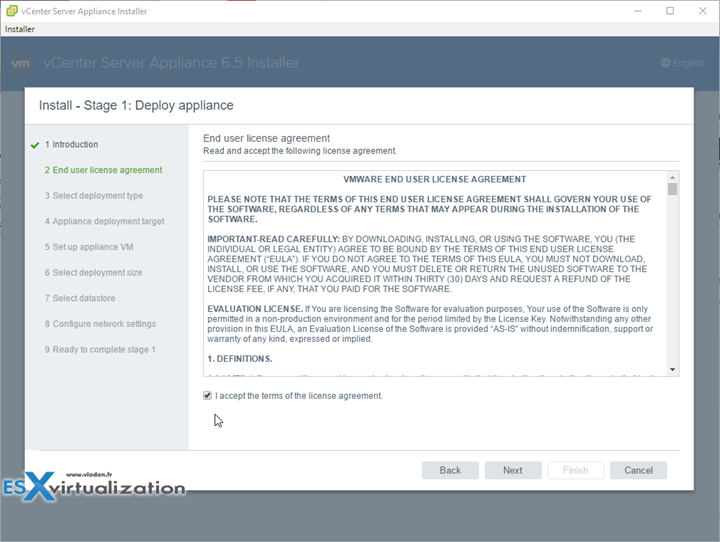 Install the license that came with your vSphere paid product and the installation will complete successfully. I’m new to virtualization especially with VMWare. Nevertheless I’m currently running the free ESXi 6.5 hypervisor on a dedicated dual Xeon server. Additionally I’ve several VMs already running. 2) Mount the ISO and deploy the OVF (from subfolder VCSA) inside my local VMware Workstation 12. So would that be a way to migrate the existing ESXi host to VCSA 6.5 without loosing all currently deployed VMs and the settings of the ESXi host? Are there any steps where I’ve to pay attention to not mess things up? I think that you’re mixing things up. You don’t need to migrate ESXi to VCSA 6.5. You have a single ESXi host? That’s fine. No need to manage it via vCenter (VCSA 6.5). But you can still buy Essentials so you can setup a backup software which needs “unlocked” ESXi host to provide you with incremental backups. Free ESXi is “locked” and can do only Full backups. 2. Finish the configuration of VCSA and Add this host to be part of your Datacenter (through VCSA user interface). Don’t use VMware Workstation to run production VMs. Workstation is meant for testing/home lab/Deve environments only. It’s completely unsupported to run VCSA in Workstation. Hope it clears your questions. 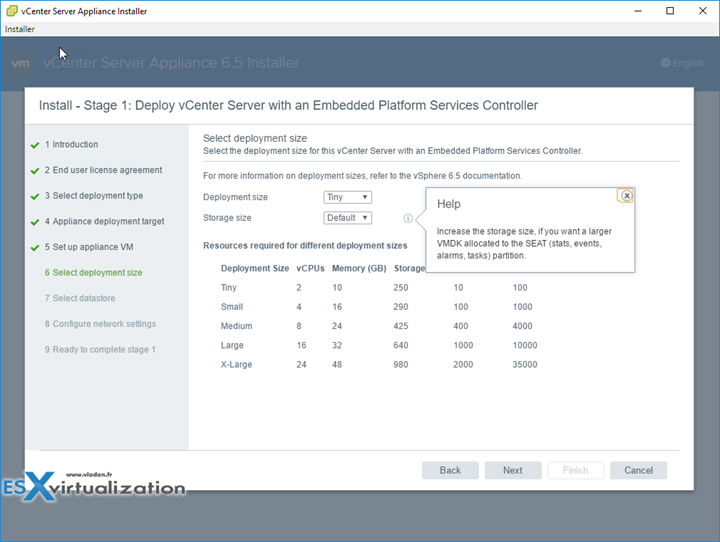 I follow your procedures above to install VCSA 6.5, during the screen showing on the deployment size, I selected tiny and press the next button, it was showing ” Not enough memory on host for the selected profile. : esxi6.5-1.lab.local “. My ESXi host VM was installed through the VMware workstation 12 Pro environment and my PC OS is windows 10 with 16GB RAM, the ESXi host setting with 4GB RAM in the setting profile. Is it because not enough ram in my PC and the tiny setting of VCSA 6.5 need 10GB ram on the setting, so showing the above error message ? I run a ESXI 6.5 essentials plus install and cannot find how to exncrypt my VMs. I now suspect it is only possible via VC server? If not, any pointers? Also, when installing the VC Server appliance according to this tutorial, do I have to do the installation on a machine residing ON the ESXI I intend to manage? Does it have to be able to reach the ESXI when installing? The reason I am asking is because my ESXI is in the cloud and I have no WIN VM only a linux based one with a minimal GUI and the UI installer gives errors and I haven’t yet found a tutorial for setting up VCSA via linux cli. Hi vladan thanks for this awesome article.i had a question about my virtualization infrastructure.i have 5 physical server.they are HP G7 and ESXi 5.5 already installed.i want to upgrade my esxi hosts to 6 Update 3.
i want to migrate from Windows Vcenter server to VCSA 6.5! So is it possible or not?should i use VCSA 6 on ESXi 6 U3 or i can use VCSA 6.5 on ESXi 6 U3 hyper-visor? 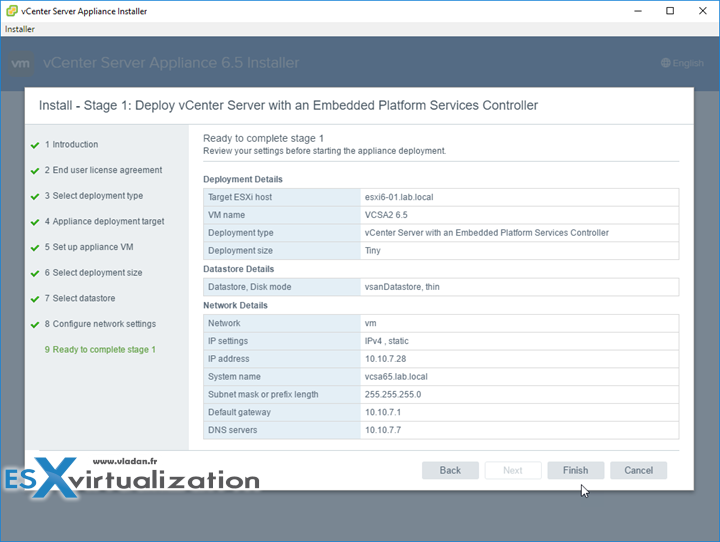 The latest VCSA 6.5 U1 can be used to migrate from Windows-based vCenter for existing 5.5 infrastructure. After migraiting the VCSA, you can upgrade your hosts (check the HCL first). My VCSA stage 1 installation got stopped on 98% with rpm error message after lot off efforts. Please help me how I can fix this issue. Hello everyone firstly thanks for the tutorial . just to point out about the 80% stuck operation it has nothing to do with the licence stuff . the problem was the iso you need to use the latest iso from vmware since the older isos are having some bugs while deploying vcenter appliance . Thanks for the update. I also noticed that if the appliance cannot reach the DNS server (the NIC is on the wrong network for example), then some services fails at first boot. Oh great news will have to download the latest build…. Cause the 4602587 build is giving nightmares… Glad you mentioned it’s “buggy”…phweks… Thanks a bunch! Quick Question – Since VCSA is free, where do I get the license for it before trial expires in 60 days?